Authorities in Mauritania should promptly and safely release a blogger who remains in detention despite an appeal Court’s decision one year ago tomorrow to commute his death sentence, Amnesty International, Human Rights Watch, Freedom Now, the Forum des organizations nationales des droits de l’Homme en Mauritanie and 28 other human rights groups said today. 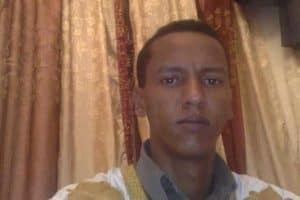 Mohamed Cheikh Ould Mkhaïtir, 35, remains in custody in an undisclosed location, with limited access to his family and no access to his lawyers, after authorities failed to implement an appeal court ruling for his release granted on November 9, 2017. Mkhaïtir was initially arrested on January 2, 2014, after he published a blog in December 2013 that spoke of slavery and discrimination, including against the blacksmith caste, which he belongs to. Following the publication of the blog, mass protests calling for Mkhaïtir’s execution for ’blasphemy’ –one of which the Mauritanian President addressed sympathetically– took place across the country. Mkhaïtir ‘’repented’’ on several occasions during his interrogation by police and in a written statement dated January 11, 2014. His trial started on December 23, 2015, and he was charged with apostasy and insulting the Prophet Muhammad, before being sentenced to death the following day. On November 9, 2017, an appeal court reduced his death sentence to two years in prison, which he had already served, and a fine. In March 2018, the Mauritanian Minister of Justice Mokhtar Malal Dia said in an interview that “the blogger Mkhaïtir is still held somewhere in Mauritania’’. “This case is emblematic of the Mauritanian government’s repression of freedom of expression and information, particularly human right defenders campaigning against discrimination and journalists covering the illegal use of slave labor,” said Kate Barth, Freedom Now Legal Director. The Mauritanian National Assembly passed a law on April 27, 2018, that replaces article 306 of the Criminal Code and makes the death penalty mandatory for anyone convicted of “blasphemous speech” and acts deemed “sacrilegious”.